The RHP® (previously the WSN® Nerve Support Formula) Nerve Support Formula is a product for those who want to build healthy nerves, including those people with neuropathy. Healthy nerves don't cause tingling, numbness or pain in your fingers, toes, hands or feet. They don't experience pain or burning or cold sensations. Healthy nerves provide proper balance and coordination. The RHP® Nerve Support Formula has been and continues to be the most successful RHP® product since it was first offered back in 2004. Often our customers will feel the need to take more capsules of the Nerve Support Formula, taking as many as 12 capsules or more a day to get the results they are looking for. The RHP® Extra Strength Nerve Support Formula was created for them. 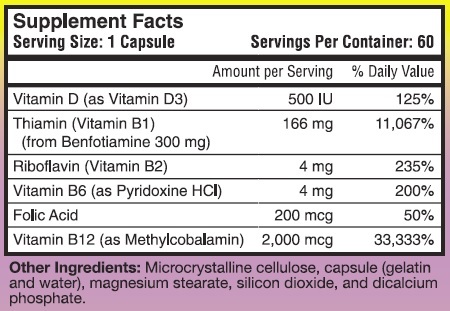 This bottle contains 60 capsules instead of 120, and the capsules are twice the size in terms of ingredients. In other words, if you were taking 12 capsules per day of the Nerve Support Formula, you would now only need to take 6 capsules a day of the RHP® Extra Strength Nerve Support Formula. If you were taking 8 capsules of the Nerve Support Formula you would only need to take 4 of the RHP® Extra Strength Nerve Support Formula, and so on. It is simply twice the amount of ingredients that are in the Nerve Support Formula. 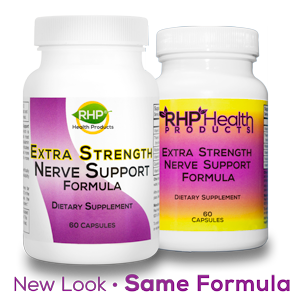 The RHP® Extra Strength Nerve Support Formula is a nutritional supplement that is specifically formulated for the support of healthy nerves. A bottle containing 60 capsules is now $45.20.